Like thousands of Minnesota families, the Remicks love their weekends at the cabin. 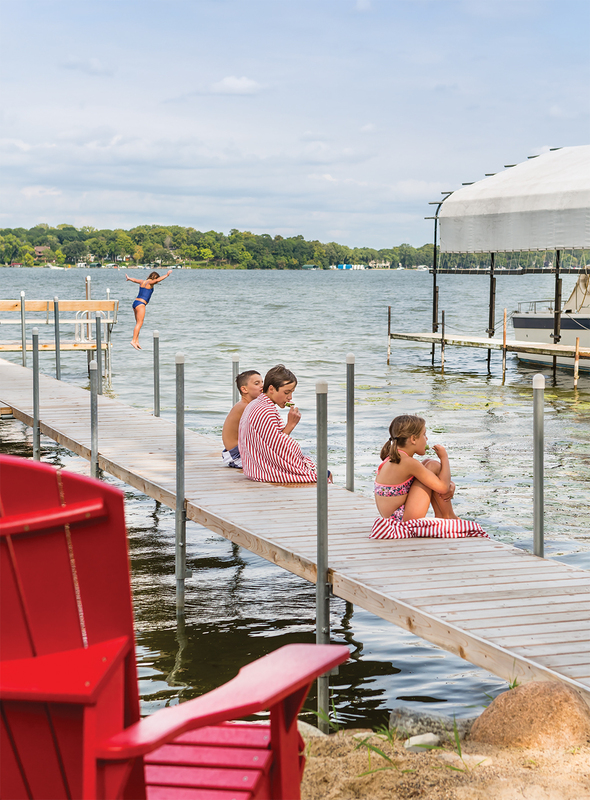 Come Friday night—after soccer and tennis and volleyball are over—they pack up and head for the lake. Unlike most Minnesota families, Rebecca, Dave and their three kids arrive about 30 minutes after they leave their Edina home. 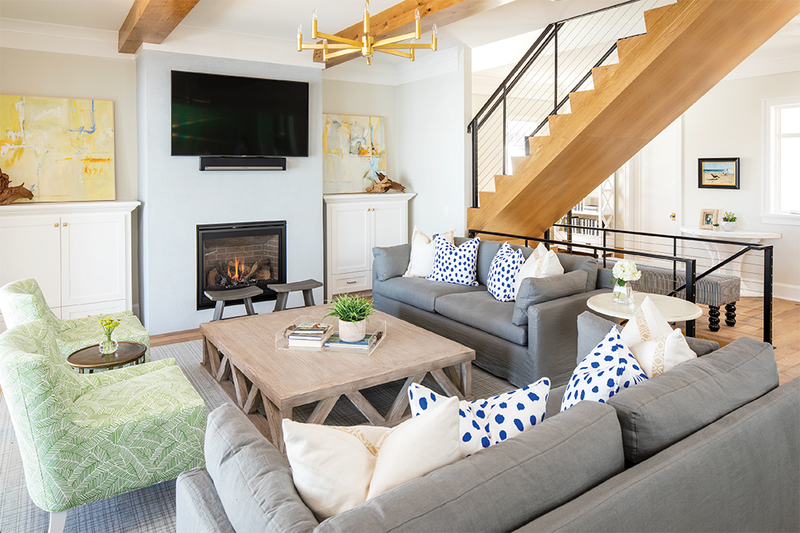 It was all part of the plan for the busy couple, principals of City Homes, a custom homebuilder in Edina, when they built their new lake home. 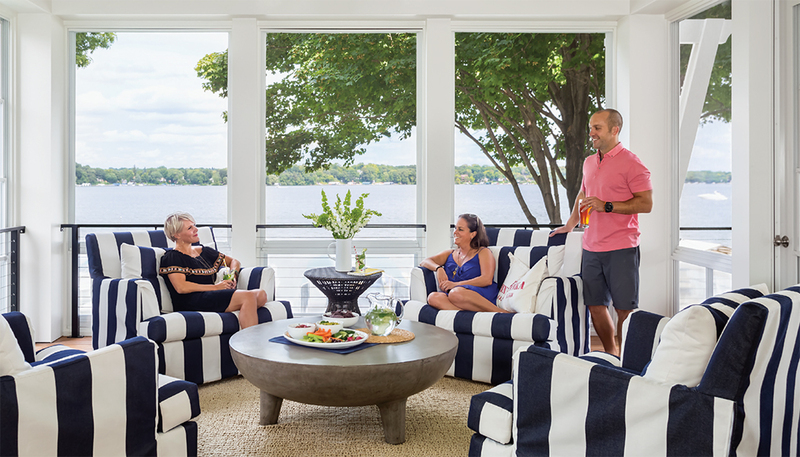 The place on West Arm on Lake Minnetonka is customized for their family’s needs, but they also built it to demonstrate a new trend in lake homes. “The idea,” explains Rebecca, “is the modern lake home for dual-income families that are super-busy, with the kids being involved in sports, but still want the family togetherness that a cabin brings.” This generation of cabin owners wants a getaway that’s close and convenient—no one wants to spend precious downtime in cabin commuter traffic. The Remicks had owned the old house on the lakefront property for 10 years. With their three kids (Alex, 13, Melissa, 12, and Adam, 10) and family friends, it got plenty of use. “We would always end up with boatloads of kids out here,” says Rebecca. Often, the kids would stay over, sleeping on the floor on a variety of mattresses she kept for that purpose. There wasn’t room for parents to stay, so they’d return to the city and come back the next day to pick up their kids. For the new house on the narrow lot, the Remicks put the garage across the street, so they could get 4,100 square feet of living space. Rebecca knew exactly what she wanted in the design: An open layout for easy entertaining and plenty of room for overnight guests. Designer K.J. Liebl of Royal Oaks Design obliged with spaces conducive to life at the lake. The front entry with adjacent mudroom and laundry are handy drop zones for the weekend’s necessities. The family room and kitchen, with lots of comfy seating all around, invite kicked-back hanging out. The kitchen island with its Carrara marble top and attached oak table functions as prep, seating, and serving areas—sometimes all three simultaneously. Pocket doors on the slider mean the kitchen can essentially extend into the porch, adding a room that’s three-seasons and then some, thanks to the fireplace and ceiling heaters. “We were out there in January this year,” says Rebecca. And those bright green cabinets? 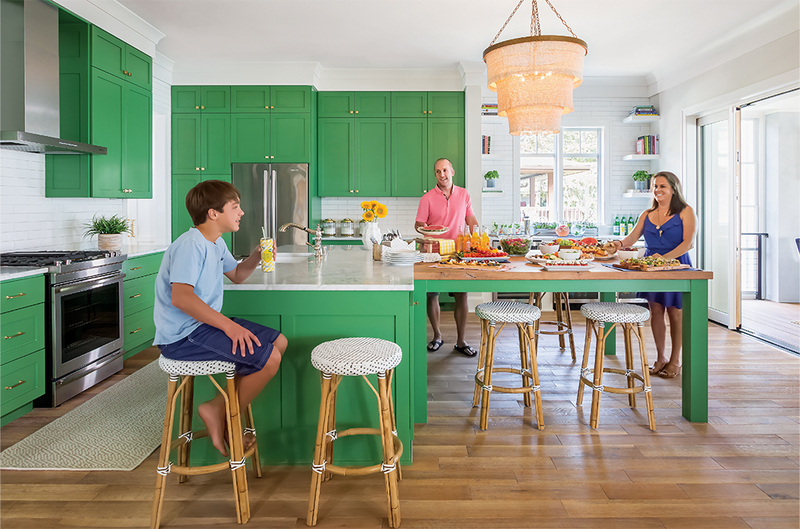 Rebecca knew she didn’t want white cabinetry and her favorite color is kelly green (she went to Notre Dame). 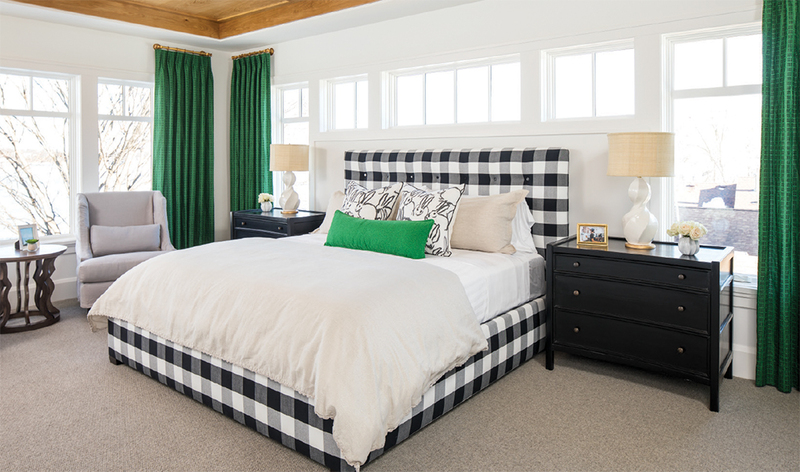 Rebecca Van’t Hull, a senior interior designer at Martha O’Hara Interiors who worked on the project, loves kelly green, too, though she admits the other Rebecca had to push to get her to commit to so much green. In the end, the two decided to go for it, with Benjamin Moore’s Bunker Hill Green. 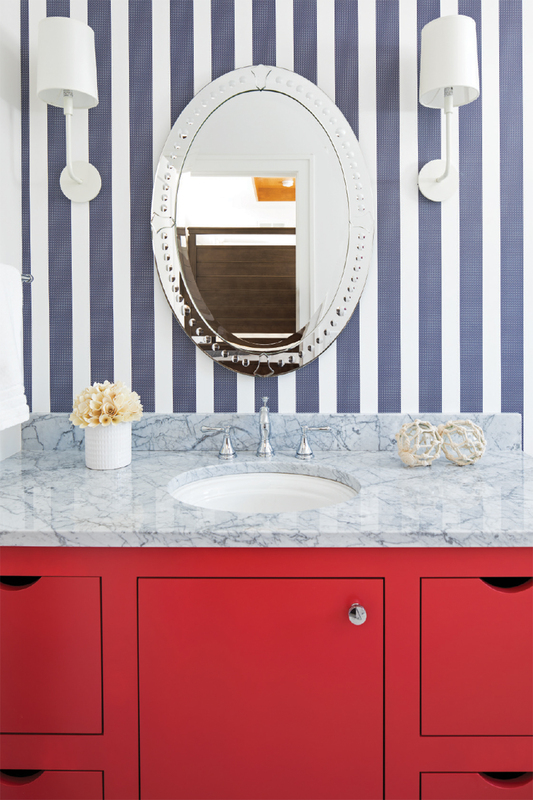 “A second home on the lake is the perfect application for something different,” says Rebecca. And it’s easy enough to repaint the cabinetry should she decide she wants a change. “Though I can’t see myself changing it,” she adds. More crowd-pleasing spaces are upstairs and down. Three bedrooms, plus the master suite, are up the suspended white-oak staircase. Rebecca wanted the bedrooms to be color-themed, so each would have its own personality and a color designation for guests. Van’t Hull chose a vivid kelly green as the accent for the spacious master suite, and red, yellow, and pink for the others. Each bedroom features its own bathroom and a queen bed with a twin bed above. 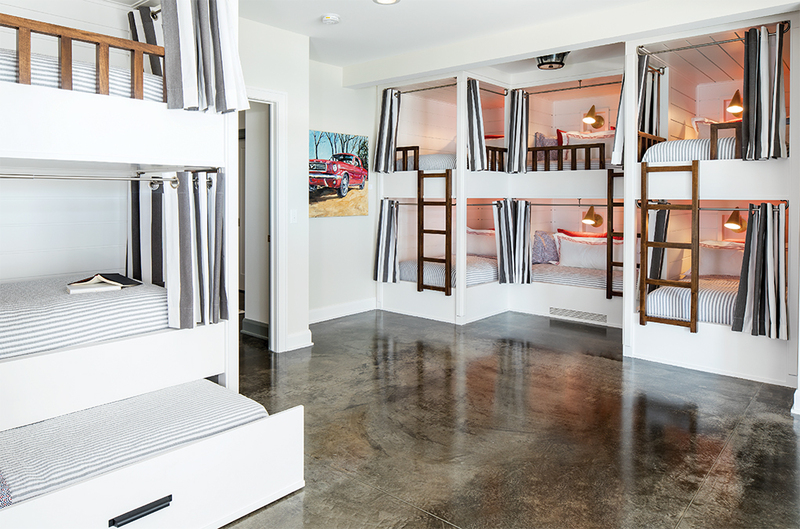 The walkout basement is made for kids—lots of them. The trundle bunk beds, custom made by Van’t Hull’s brother at his furniture shop in New Orleans, Monkey Wid-a-Fez, provide sleeping space for 12. Each little cubby has its own light and USB port, along with privacy curtains. 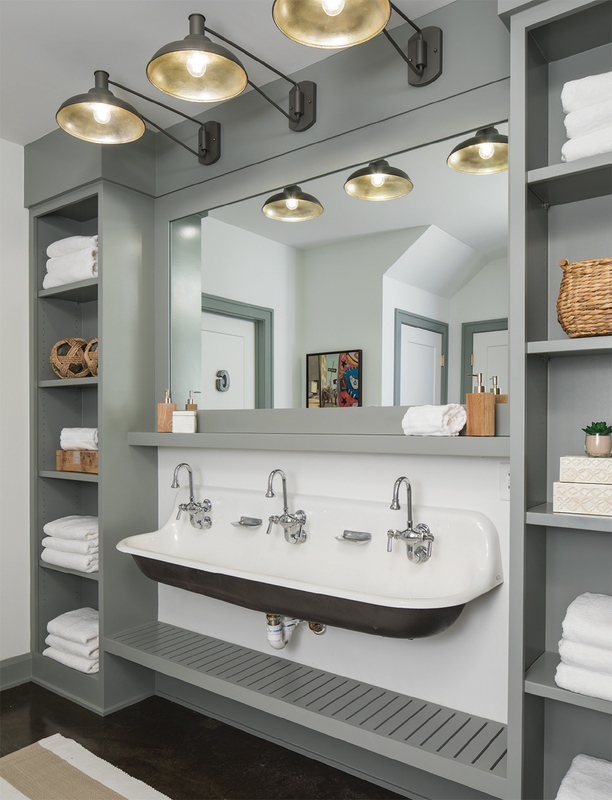 Then there’s Rebecca’s brainchild: separate changing areas, showers, and toilets for boys and girls; in the middle is a common wash area with a wall-mounted trough sink with three faucets. The basement is built to take whatever the kids can dish out, with a poured concrete floor finished with a bit of grit to prevent wet feet from slipping.